Whether a farmer is raising one cow or a herd, Storey’s Guide to Raising Beef Cattle is the most reliable reference for ensuring a successful, healthy cattle operation. 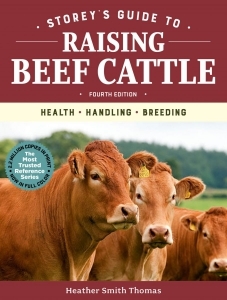 In this fully updated, full-colour 4th edition, long-time cattle rancher and author Heather Smith Thomas explains every aspect of bovine behavior and provides expert guidance on breed selection, calving, feeding, housing, pasture, and health care. Along with in-depth information on raising grass-fed animals, there is also advice on creating a viable business plan and identifying niche markets for selling beef. The fourth edition of the most trusted and comprehensive reference on beef cattle health care, breed selection, and grass-fed cattle raising techniques is now fully revised and updated, and features colour photography and illustration.